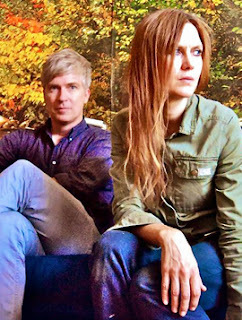 For the better part of two decades, Matthew Caws and Juliana Hatfield have carved out independent careers. Caws is probably best known for his 20-year-old New York City group Nada Surf. Hatfield struck out a soloist as well as a member of Blake Babies and Some Girls. They could have easily kept doing what they do. Hatfield raised 400 percent more than the cost of production on PledgeMusic for There's Always Another Girl just two years ago. Nada Surf recently released The Stars Are Indifferent To Astronomy last year. Both were very well received. But these independent careers weren't the only thing happening along the Hatfield and Caws timeline. Their collaborative spirits entwined in the 1990s, with minor contributions to each other's respective albums (Hatfield's Such A Beautiful Girl and Nada Surf's B-side I Wanna Take You Home). They've been on a trajectory destined to cross ever since. Minor Alps is a collaborative collision between two brilliant songwriters. The duo have said they've always had a connection, as if they spoke the same language or perhaps shared ancestors. Much of that connection can be heard on the debut album too. Sometimes it isn't clear which vocalist is commanding attention as their voices fuse, a term that underscores Get There. Hatfield and Caws truly own every inch of the album together. Aside from songwriting and sharing lead vocals, they play every instrument and conjure up every sound. The only exception are the contributions made Parker Kindred (Jeff Buckley, Anthony and the Johnsons) and Chris Egan (Solange, Computer Magic) on drums and programming. And then there is the vision of it all. Take a track like I Don't Know What To Do With My Hands and the chorus cuts through the rock hook and sheds some light on the emotional solitude they conjure up in eleven tracks. In this case, the song pinpoints that moment in time when every possibility is open and can be played out. In some ways, it's a micro moment in comparison to the bigger theme played out on the album. The album Get There is all about being at a perfect time, place or a space. And then the idea is held together by ageless existential youth, a quality you need wisdom to appreciate and yet it fades almost immediately after you find it. It's fleeting and forever: a blur between perception and reality. Along with I Don't Know What To Do With My Hands, Mixed Feelings has plenty of energy with electric guitar buzz, but most of the album is restrained to a more even pace. Waiting For You is as a delicate as it is hypnotic. Buried Plans is isolated and spooky. If I Wanted Trouble is circular in its quiet acceptance that everything comes back around if you don't learn from it the first time. Through it all, you can almost see Caws and Hatfield talking about life somewhere, off in the corner while the rest of the world maintains a hurried pace. This might even be the best thing about the album. There is so much space between the listener and the compositions that it almost feels like eavesdropping at a slower pace than they even perform it. Far From The Roses punctuates that point. There is an ebb and swell to the track that feels like it could carry someone further and further from shore if they let it. As with many of the tracks, the complementing dual lead vocals make it even more haunting. It's hard to stop listening. Get There By Minor Alps Peaks At 8.1 On The Liquid Hip Richter Scale. There are a few moments on the album where you might wonder about the instrument selection, but no other new collaboration will beat this one this year. The pairing of these two accomplished musicians has found its place in history. It's well worth hoping that we Get There more often. You can find Get There by Minor Alps on Amazon. The vinyl is also listed at Barnes & Noble or can be downloaded from iTunes. The band is currently on tour, with Sylvan Essa opening. The latter duo is made up of Amelia Meath and Nick Sanborn. To keep up with Minor Alps, find them on Facebook.